‘As I have never had anything made for me in this way or to this level, I only knew of things being made in an ‘Auntie knitting you a cardi for Christmas’ type way, where you have to be polite and say how great it is, even when you are not too sure. However, working with you was nothing like have a cardi made for me as a Christmas gift! ​I suppose as it was a long lived childhood dream to have a suede dress for my wedding dress I was hoping not be disappointed at the reality of my own idea, once it had been made. It was really reassuring to see that you are so sensitive to the fabrics used being right and so specific about getting it just so. It is this approach and strive that I think really made this dress come together and be pulled off as a really resolved design throughout. 'My biggest fear of having my wedding dress made was the fact you can't try on the finished product until it is finished! 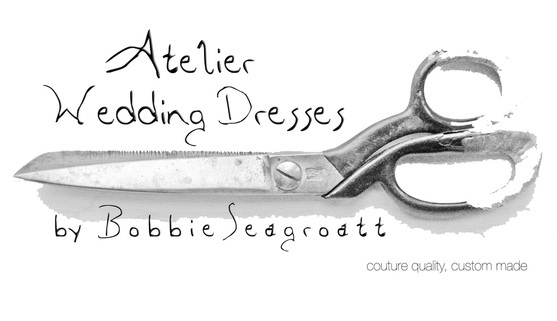 Bobbie contained this fear by being always up beat and confident, producing an amazing twirl (toile! :-) for me to try, out of a linen material, completely taking my fears away. My favourite part of the process must have been the design stages. Starting with a drawing found in the family home dated 1937, of (we think), the wedding dress of a long lost relation's wedding dress, being a fantastic artist, Bobbie then recreated our ideas in sketch form giving me 6 designs to choose from. Should a friend request a designer for any type of outfit, I would gladly pass Bobbie's details on. I would describe my experience with Bobbie as extremely fun and exciting. Bobbie is a very talented, easy going person. Thank you Bobbie for making my day so special. 'I'd also just like to say how pleased I am that I had found you to make my dress, I'm so looking forward to it being finished! "My outfit was the topic of conversation - I had so many compliments . Everyone said it was so 'me' not the usual 'mother of the bride' It brought the countryside to the wedding!!! Thank you so much for making my day very special and comfortable too! "I felt really good in the outfit and had so many amazing comments about it from both young and old"
"I could never thank you enough for the beautiful dresses you made us, I know how much care went into making them, which makes them even more special. I hope you were as proud of your work as I was wearing it." "Thank you once again for the nicest dress I have ever had." "I have to say those bridesmaid dresses you made were the nicest bridesmaid dresses I have seen! I know that you are going to be constantly busy!" "I loved the drawings for my dress - just what I imagined."